Here is a famous structure on the D&RG. Tall timbers make the majestic Coal Tipple in the Chama yard one of the highest on the railroad. The delicate weaving of massive wooden columns is a great reminder of the railroad builders skill. 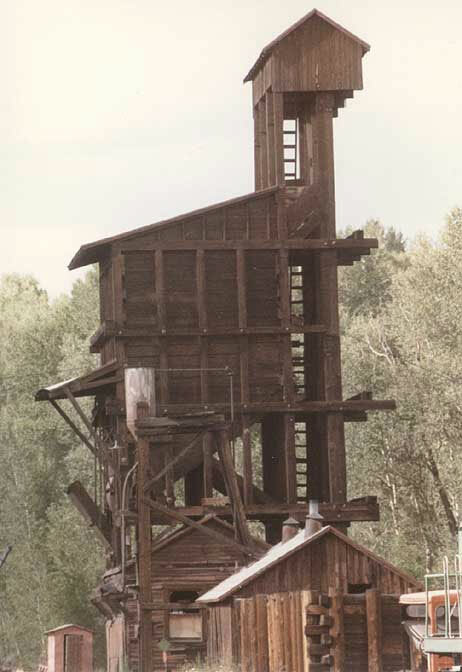 The Coal Tipple has withstood all that nature has dealt since 1924. Coal is delivered to the hungry mountain locomotives when they pull beneath the chute in front of the Tipple. A clever drive-over car dump hopper and double-bucket hoist in the back of the Coal Tipple fill the 75 ton coal bin. Inside the mechanical building at the base of the Coal Tipple, an oil burning engine provides the power needed to lift the coal over 50 feet into the bin. These files require Cadrail Version 9 or the Cadrail Demo to view and print. This version of the tipple drawing with all views and details is not on the Cadrail CD. This drawing is only found here and on the D&RG MAK DVD from Sandia Software. On the DVD there are more details and photos of this and many more structures.